Today, anyone and everyone are taking medicines and supplements for some reason or another. But, have you stopped to think what the difference is between medicines and supplements? It’s true that we’ve been using pharmaceutical drugs or medicines for most of our lives. But we all see the change now, and the natural and organic lifestyle is growing. That means many people are going back to their roots and relying on homemade natural supplements or herbal medicine. But before we talk about supplements, let’s find out what the key difference is between medicines and supplements. So basically, medicinal drugs come with chemicals that can possibly unbalance the body and just cover up the problem, while supplements are simply an extension of your diet and give the right vitamins and minerals to the body to help repair the cells and the overall benefit to the body. I’d prefer to have a handyman in my body rather than a group of acrobatic gymnasts. What about you? RELATED: Antibiotics Screwed Up My Gut, Now What? 1. Notion: Supplements can help prevent conditions like diabetes or heart disease. Well the fact is that Supplements aren’t intended to treat any specific health issue. Keep in mind that supplements ‘fill in the nutritional gaps’ in a well-rounded diet, nothing more. Supplements help us reach the daily nutritional needs that are tough to meet with food alone. For example, Vitamin D is not found in many whole foods, so taking a supplement for the same can be helpful. Supplements are one piece of the puzzle in helping us prevent illnesses, although exercising and eating right are also just as crucial. 2. Notion: Supplements can make up for your diet’s flaws. The actual fact is that you still need to have a well-rounded diet. Supplements cannot replace a healthy diet. You need to look at them as a tool, something you take on top of eating well. When you get most of your nutrients from the food you eat, you can generally trust the body to absorb what it needs. When you rely on supplements instead, however, you run the risk of taking in too much, which can be harmful to your health. For example, too much vitamin A can increase your risk of osteoporosis; too much vitamin E can elevate your risk of suffering a stroke; and too much iron can raise your risk of heart disease. Excesses of these nutrients are stored in fat and are not excreted, so they can build up in the body and become toxic. 3. Notion: It is best to take supplements on an empty stomach. Actually, the fact is that supplements are always better absorbed with food. If you don’t take supplements with your meals, there’s a good chance your body will simply excrete most of it. When we eat whole foods, our body’s digestive system very efficiently takes out certain nutrients along the way — B vitamins at one point, calcium at another, etc. — and excretes much of what’s not needed. When you take a supplement though, your stomach acids have to do all the work— dissolving the pill and sending nutrients back out to the various body parts, which become less efficient. However, when you take supplements with food, the nutrients in the pill bonds with the food and you get the best delivery and absorption. 4. Notion: More supplementation is always better. You know the saying; anything in excess is bad for you. Toxicity occurs with water-soluble vitamins, fat-soluble vitamins and minerals, which is mostly what our supplements are made of. Fat-soluble vitamins, vitamins A, D, E and K have the ability to be stored in the body in the largest amount, so they pose the biggest threat as far as toxicity. Water-soluble vitamins, vitamins B and C are typically excreted in the urine when they are ingested in excess. However, it is still possible to develop toxicity with water-soluble vitamins too. Toxicity is usually as a result of too much supplementation; reactions can differ depending on the nutrient. For example, a toxicity of vitamin C can cause upset stomach or kidney stones, whereas a toxicity of vitamin A can cause headaches, dizziness, or joint pain. How much you need of any given vitamin or mineral should be determined by your health care provider. 5. Notion: Most people need to take supplements. Many of us can get all our nutrients through a well-balanced, healthy diet; that include fruits, vegetables, lean proteins and whole grains. However, todays wholesome foods are also stripped off certain nutrients and in cases of deficiency that cannot be solved through food alone, taking the specific vitamins and minerals in which you’re deficient can help fill the gaps. Supplementation should be tailored and personalized to your blood work and medical history. For example, many cholesterol medications lower the levels of an incredibly important antioxidant known as CoQ10 in our bodies. So taking supplements with that is important. Always remember that before taking any supplements, you should check with your nutritionist. 6. Notion: All supplements are equal. The fact is – ingredients matter. Choosing supplements with the right combination of nutrients is essential for the body to absorb, assimilate and to function. Make sure the supplements you take are non-synthetic, non-GMO, and chemical free. Make sure that the ingredients come from natural sources and have a good formulation. Always consult with a nutritionist for your supplementation needs. Now you know the key difference between medicine and supplements and why supplements are necessary in our busy lifestyle. Always check the ingredients if you’re taking supplements and consult with a nutritionist before starting. 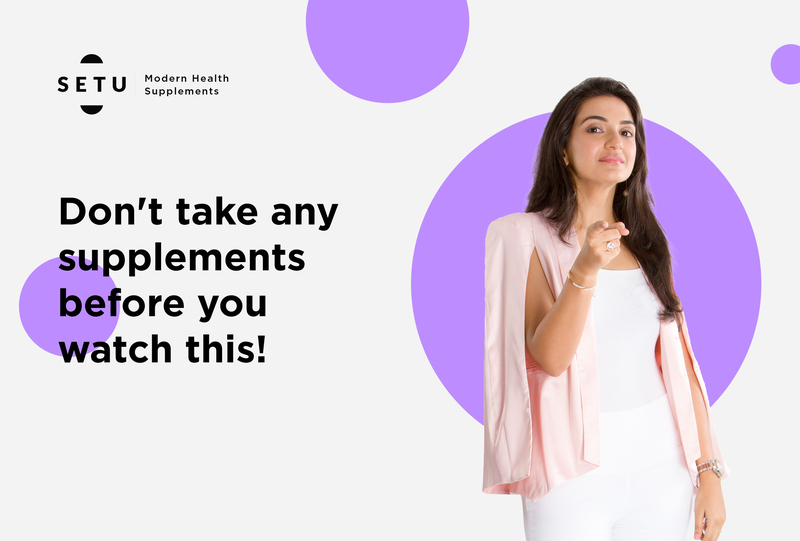 For more information about supplementation or to purchase all natural supplements, you can visit the Setu website or click on the link below to watch a video about supplements on the Setu YouTube Channel.